This property is perfectly situated in the medieval quarter of Lectoure in one of the most picture-perfect roads in Lectoure, facing the Pyrenees and conveniently situated for easy access to the town centre on foot. The property has a fascinating history and was once three properties, inhabited by local shop-keepers in the 18th century. The property was in poor condition when its current owners purchased it, and they have lovingly restored it over the last few years, carefully preserving any original features and redoing the roof in 2012. Their adventures in restoration contained one surprise: the owners discovered two hidden rooms which had been sealed away on the upper level for many years, and which they have left intact. Here we find a museum of the past, with the objects on the table and chimney laying as they were left so many years ago. Although this space has not yet been converted it was a bonus, allowing for the creation in the future of two extra first floor bedrooms. Access to the property is from the street, and we find ourselves in a bright and cheery entrance hall, which is blessed with the original red and white chequered turn-of-the-last century floor tiles which make this space so joyous. From the entrance hall there is access to the reception room and the kitchen/dining-room. The reception room has the original pale pine floorboards and exposed stone walls. There is an open fireplace, at the foot of which lies a row of old patterned floor tiles, in warm terracotta tones of red, adding to the charm of the room. There is a window to the front street, and for storage an old wall-cupboard painted in pale Lectoure blue. The kitchen/dining-room are fully refurbished and decorated in a contemporary style with sober grey units. There is a characterful stone sink against the old stone and terracotta wall and beautiful patterned turn-of-the-last-century floor tiles throughout. In the dining-room there is an open plan fireplace. Beyond the dining room there is a laundry room, and a space for the dish-washer. The doors are painted in a vibrant Basque colour of red to match the turn-of-the-century floor tiles. In this section of the property there is also a downstairs shower room with WC. The three bedrooms are decorated in soft grey and beige tones, and wherever possible the original features of the property have been left to shine through; the stone walls, old sinks, original doors, and even the original old-fashioned keys. On the first-floor landing, there is a shower room (with WC) tiled in light blue ceramic tiles. On the ground floor level there is a large barn which could be developed into a downstairs reception room or used for storage as by the current owners. Above the barn we climb a ladder upstairs and discover the “secret” rooms hidden away from view for possibly a hundred years. 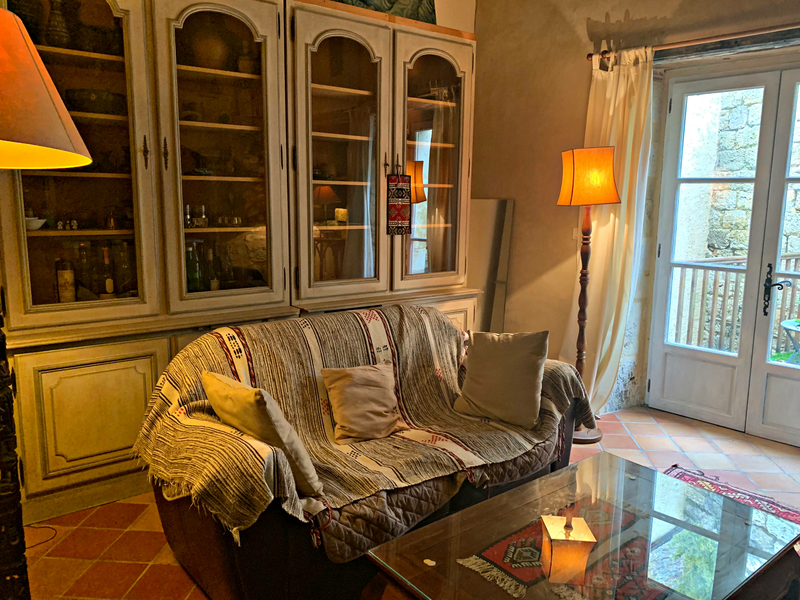 The location in Lectoure, in one of the prettiest quarters of the old town on the side of town facing the Pyrenees and the sunny south-westerly aspect of the property. The additional advantage of the owner having discovered an extra 40m2 attic space which offers a tremendous potential for further development. The original old features throughout, and the pretty floor tiles, which add so much character. Once three cottages, and now one single home, the property may be used as a spacious home, or perhaps for lettings, in a highly popular town, close to the thermal centre. This is a light, bright, happy home, that is characterful throughout. Although there is no outdoor garden space, all the amenities in town are accessible on foot; the market, shops, tea-rooms, cinema, parks and local panoramic pool. As such this would also make a fantastic lock-up and leave holiday home, or a perfect lettings investment opportunity (with a total of three houses possible) in the heart of Gascony’s most sought-after town. NB: Our working relationships are built on mutual trust with our vendors. By so doing we are able to show photographs which clearly indicate the location of a property. This is not current practice in France. However, it should be noted in such cases that the current owner has chosen to advertise exclusively with our agency as he/she does not wish to enter into negotiations privately with potential buyers or to be contacted directly, choosing to remunerate an agency instead of handling the sale privately. All agency fees are payable by the VENDOR. We cordially invite all buyers interested in viewing a property to contact our agency. We are happy to advise and help throughout the process. * We won't share your email with any third parties.